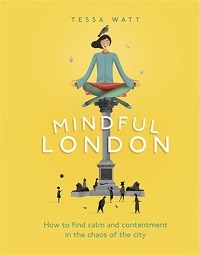 There are many self books that help Londoners and visitors to cope with the stress of everyday life in the capital, however this book introduces the concept of Mindfulness which not offers the way to cope but offers strategies to enjoy the richness of urban life. The concept of Mindfulness has attracted considerable interest in recent times especially through the work of Professor Mark Williams and his best seller Mindfulness : A Practical Guide to Finding Peace in a Frantic World. The author of this book attempts to apply the Mindfulness concept to London life, she considers the term Mindfulness is a simple idea. ” It means being here in the present movement – right here, right now, without wanting it to be somehow different.” She also points out that Mindfulness is not all about finding quiet and relaxation but also enjoying being in the present by enjoying the small details that are part of our everyday life. The first chapter concentrates on some of the basics of Mindfulness, as the author points out, ” When we practise mindfulness we make time to step out of our normal whirlwind of activity and cultivate our ability to be present ; to connect with a greater sense of spaciousness.” As part of many people’s strategies of dealing with stress, they tend to switch off and go into ‘autopilot’, this can lead to negative events when a small event can trigger anxiety and irritation. Mindfulness offer strategies to put things in perspective and appreciate the small elements that make up our everyday life. Part of the strategies is learning breathing techniques and becoming more aware of your body to feel grounded. The benefit of using theses techniques is shown to include reducing stress, reducing rumination, better coping with illness and increasing wellbeing. Each chapter is organised around a theme : nature, commuting and travelling, art and architecture, silence and solitude, sounds and music, food and drink, movement and learning mindfulness. Within each chapter there are an overview of the theme, some mindfulness techniques, some suggestions for interesting pastimes and finally a small guide to some of the best places in London to visit. Talk to any Londoner and sooner or later the conversation will come around to the stress related to travelling around the city. Therefore the chapter Mindful Commuting and Travelling will be of particular interest to many people. Some practical suggestions offered include leaving yourself extra time, breathing techniques when in stressful situations, taking a different route to add variety and mindful walking. Many of the chapters relate to making better use of our senses Seeing (Chapter 4 ), listening (Chapter 6), tasting (Chapter 7) or the physical sensations of our body ( Chapter 8 ). However it is often a matter of having a holistic approach that will pay the highest dividends, therefore the chapter entitled ‘ Learning and Practising Mindfulness ‘ offer a series of practical exercises and advice if you want to take the method further. In the final chapter, the author looks at the growth of Mindfulness and the way it is being used in the workplace and by health practitioners to deal with stress and depression. She makes the point that both of these ailments are on the rise with people working for longer hours under greater stress. There are more people unable to cope and stress has now become the most common cause of long-term sickness leave. There are many books that offer advice on how to deal with the stresses of a busy urban life, although most tend to concentrate on finding peaceful havens to rest and relax. Mindful London includes these strategies but take it further by suggesting that a change of mindset is needed, so that what we find stressful episodes can be turned into a more positive and pleasant experience. The Mindful method quite correctly points out that the many people who go into ‘autopilot’ miss out on some of the wonderful parts of the city and fail to enjoy some of the pleasures of urban life. This well written and insightful book will appeal to those people who would like to find ways of dealing with the many stresses of London life, it will also be popular with those who seek to introduce a more balanced approach to urban life. Even if you are not completely attracted to the meditation or reflective side of the book, Mindful London offers places to visit and practical advice to enable Londoners and visitors to get the most of the capital. By londonvisitors2014 in London Book Review - Non Fiction on November 4, 2014 .